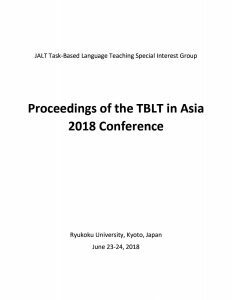 The JALT TBL SIG oversees the regular publication of our newsletter, OnTask (2011-2015) and Taking it to Task (from 2016), as well as the proceedings of the biennial TBLT in Asia conference. 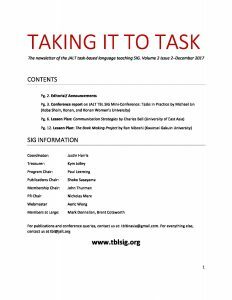 If you have a TBLT-related article, lesson plan, book review, or opinion/think piece that you would like to submit for consideration in a future issue of Taking it to Task, please contact us at <tbltinasia@gmail.com>. Submissions are accepted year-round and you do not need to be a SIG member to contribute. Pg. 88. 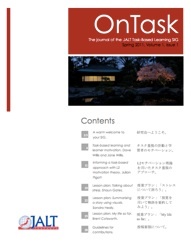 Task-based English curriculum innovation for computer science majors in Japan: Preliminary report by Emiko Kaneko et al. Editorial / Announcement, pg. 2. An Evidence-Based Approach to L2 Task Design by Shoko Sasayama, pg. 3. Lesson Plan: A Market Research Survey Project. Nicholas Marx, pg. 6. Lesson Plan: Storytelling: Tapping Student Imagination. Simon Rowe, pg. 12. 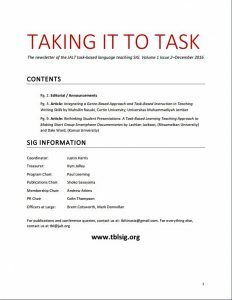 Conference Report on TBL SIG Mini-Conference: Tasks in Practice by Michael Lin, pg. 3. Lesson Plan: Communication Strategies. Charles Bell, pg. 6. Lesson Plan: The Book Making Project. Ran Niboshi, pg. 12. 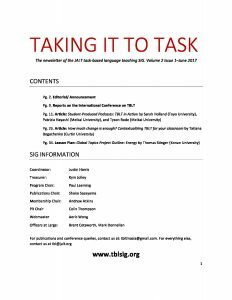 Reports on the International Conference on TBLT, pg. 3. Student-produced Podcasts: TBLT in Action. Sarah Holland, pg. 12. How much change is enough? Contextualizing TBLT for your classroom. Tatiana Bogachenko, pg. 27. Lesson Plan: Global Topics Project Outline: Energy. Thomas Stinger, pg. 38. Integrating a Genre-Based Approach and Task-Based Instruction in Teaching Writing Skills. Muhsilin Rasuki, pg. 3. Rethinking Student Presentations: A Task-Based Learning Teaching Approach to Making Short Group Smartphone Documentaries. Lachlan Jackson, pg. 9. Task-based language assessment for young learners. Yuko Goto Butler, pg. 3. 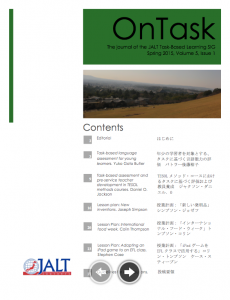 Task-based assessment and pre-service teacher development in TESOL methods courses. Daniel O. Jackson, pg. 9. Lesson plan: New Inventions. Joseph Simpson, pg. 16. Lesson plan: International food week. Colin Thompson, pg. 20. Lesson plan: Adapting an iPad game to an EFL class. Stephen Case, pg. 23. Guidelines for contributions, pg. 27. ‘Getting it’ together: Creating a collective understanding of TBLT within departments. Travis Henry, pg. 4. Exploring the potential of TBLT for academic abstract writing. Jennifer Teeter, pg. 9. Lesson plan: Story Books to foster low-level students’ writing ability. Agnes Patko, pg. 21. Lesson plan: Online surveys in the CALL classroom. Justin Harris, pg. 25. Lesson plan: Autobiographical Presentation Project. Henry Foster, pg. 29. Guidelines for contributions, pg. 33. The 2nd Bi-annual TBL in Asia Conference, pg. 3. Before and After the Task: Potential Research-based Contributions. Peter Skehan, pg. 4. 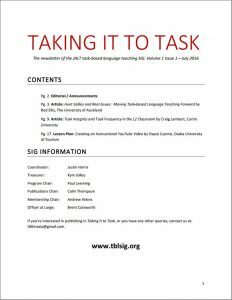 Task-based learning in language teacher education. William Littlewood, pg. 11. Lesson plan: The Language Learner History Project. Oana Cusen, pg. 17. Lesson plan: Around the international business table: A task utilizing direct/reported speech and active translation skills. Matthew W. Turner, pg. 22. Lesson plan: Lesson Plan: The Marshmallow Challenge. Sam Crofts, pg. 28. Guidelines for contributions, pg. 31. TBL in Asia 2014 preview, pg. 2/3. Power-sharing in the Asian TBL classroom: Switching from teacher to facilitator. Robert Stroud, pg. 4. TBLによるコミュニケーショ ン実践能力養成の検証:TBL への好意性がコミュニケーシ ョン実践能力への自信と学習 意欲に与える影響。豊田順子, pg. 11. Lesson plan: “What is your greatest pleasure in life?”. Ben Humphreys, pg. 22. Lesson plan: Lesson plan: Alphabet Speeches. Michael Crawford, pg. 29. Lesson plan: Lesson Plan: Building fluency and accuracy through task sequencing. Colin Thompson, pg. 32. Guidelines for contributions, pg. 42. Our first year as a full SIG, pg. 2/3. Capturing experience and creating community through digital storytelling. Peter Gobel, pg. 4. Getting started with TBLT: A personal account. Natsuko Shintani, pg. 13. Lesson plan: Design a bag. Travis Henry, pg. 20. Lesson plan: Study Management Task. Martin Mullen, pg. 23. Lesson plan: Theme-based discussion tasks for student interaction. Nick Domjancic, pg. 27. Students’ L1 use for task work. Yusa Koizumi, pg. 3. Task-based language teaching and learners’ second language development. Ayaka Hashinishi, pg. 7. ‘Keeping it real’: Implementing a task-based curriculum in an EAP context in Vietnam. Carla Bridge & Fiona Wiebusch, pg. 11. Task-based telecollaborative projects for beginner-level students-Increasing authenticity in the EFL classroom. B. Greg Dunne, pg. 16. Designing and choosing information gap tasks for the low-level classroom. Josh Cohen, Mark Donnellan & Jeffery Crawford, pg. 20. Task-based learning and the 2003 action plan: An examination of tasks produced by SHS JTEs. Gregory C. Birch, pg. 24. 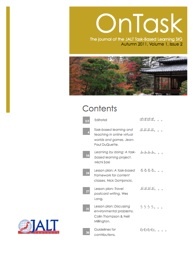 JFL teachers’ perceptions of task-based language teaching: A case study of Japanese language teachers in Hong Kong. Masaki Seo, pg. 28. 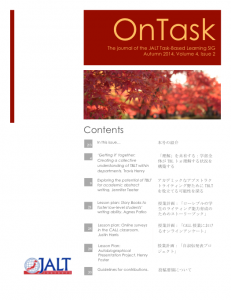 The effects of task complexity on Japanese learners’ planning strategies. Colin Thompson, pg. 33. Carousel mini-presentations: A merry-go-round of authentic communication. Sean H. Toland & Jeffery Crawford, pg. 38. A study of pre-reading tasks for EFL high school students TBL. Huei-Chun Teng & Chia-Ling Chang, pg. 42. Three principles for encouraging TBL in the team teaching environment. Bryan Gerard, pg. 47. Focus on meaning in primary school TBLT in Chinese: A case analysis. Yeo Leng Leng & Chen Seow Chin, pg. 50. Designing and delivering tasks to less proficient EFL learners at Japanese University. Reiko Nishida, pg. 56. Assessing assessment practices in TBLT classrooms. Fergus O’Dwyer, pg. 59. A pilot study of 3 tasks. Robby Caughey & Gareth Eggie, pg. 66. Is it a potential panacea? Retrospection on Task-based learning and teaching in Hong Kong. Dan Lu, pg. 70. An effect of text-based tasks on incidental vocabulary acquisition. Mutsumi Kawakami, pg. 74. “Is TBL right for Asia?” the wrong question? William Hogue, pg. 80. Elaborating specific tasks for doing three different reporting projects – To become a real writer. Guidelines for contributions, pg. 88. 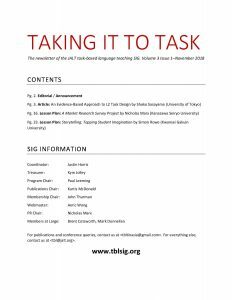 Task-based language teaching in Confucian-heritage settings: prospects and challenges. David Carless, pg. 4. Towards a more balanced approach in TEFL through TBL. Steven Herder, pg. 9. Lesson plan: Using trivia to stimulate discussion. Jonathan Enns, pg. 15. Lesson plan: Leadership election. Colin Thompson, pg. 18. Lesson plan: Silent Video: Shaun the Sheep narration. Mark Donnellan, pg. 23. Guidelines for contributions, pg. 26. Task-based learning and teaching in online virtual worlds and games. Jean-Paul DuQuette, pg. 4. Learning by doing: A task-based learning project. Michi Saki, pg. 16. Lesson plan: A task-based framework for content classes. Nick Domjancic, pg. 24. Lesson plan: Travel postcard writing. Wes Lang, pg. 27. Lesson plan: Discussing environmental problems. Colin Thompson & Neil Millington, pg. 31. Guidelines for contributions, pg. 36. Task-based learning and learner motivation. Dave Willis and Jane Willis, pg. 4. Informing a task-based approach with L2 motivation theory. Julian Pigott, pg. 11. Lesson plan: Talking about stress. Shaun Gates, pg. 19. Lesson plan: Summarising a story using visuals. Sandra Healy, pg. 22. Lesson plan: My life so far. Brent Cotsworth, pg. 25. Guidelines for contributions, pg. 28. Copyright ©TBL SIG 2019. All Rights Reserved.